Our research in Mathematics and Statistics have achieved remarkable recognition since 2009. 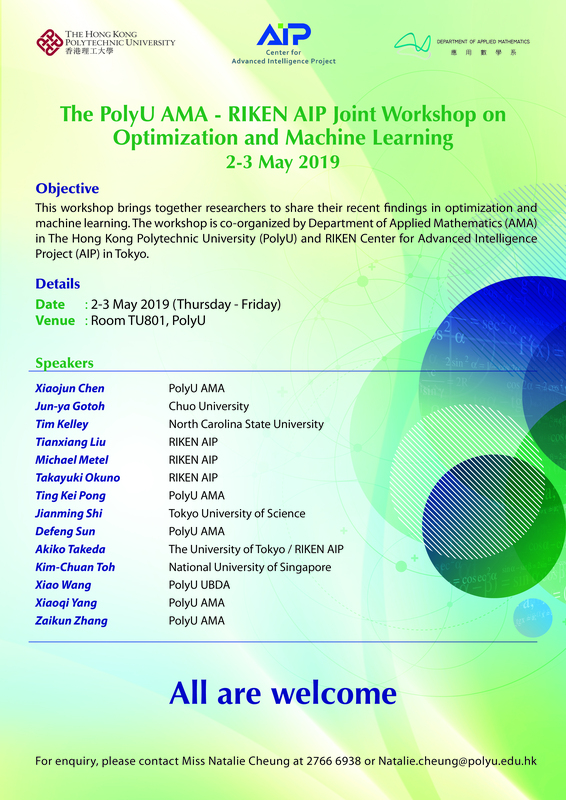 According to The Research Assessment Exercise (RAE) 2014 conducted by the University Grants Committee of Hong Kong, 71% of AMA’s research has achieved a 4- or 3- star rating i.e. ‘world leading’ or ‘Internationally excellent’ by international standards. Moreover, since 2015, ISI Essential Science Indicators (ESI) has listed PolyU as a highly cited institution in Mathematics. In 2019, PolyU is listed the world top 100 in the subjects of Mathematics, and Statistics and Operational Research by the Quacquarelli Symonds (QS) World University Ranking, and the 74th Best Global Universities for Mathematics by the U.S. News & World Report. AMA’s ranking by different ranking agencies in the recent years. Industrial collaborating grant from Huawei Technologies Co. Ltd.
On top of our research accomplishment, we are also proud of our effort in making significant advance in teaching. In summer 2017, our teaching team proposed a Teaching & Learning project titled “Developing Active Learning Pedagogies and Mobile Applications in University STEM Education” and won a funding from the University Grants Committee UGC Funding Scheme 2016-2019. The project involves three other local universities (Hong Kong Baptist University, The Chinese University of Hong Kong, The University of Hong Kong), while our teaching team plays the leading role. We are thrilled to win the Department’s first UGC Teaching and Learning funding, and will continue to strive for further improvement. In October 2017, PolyU established a new University Research Facility in Big Data Analytics. AMA is tasked to manage the facility jointly with the Department of Computing. It will facilitate multidisciplinary research in big data. Prof. Sun, together with his collaborator Prof Kim-Chuan Toh and their former PhD student Dr. Liuqin Yang, was awarded the triennial Beale--Orchard-Hays Prize for Excellence in Computational Mathematical Programming 2018 by the Mathematical Optimization Society. The award is for their work on SDPNAL+, which is a solver for large-scale semidefinite programming. The prize was given out at the opening ceremony of the International Symposium for Mathematical Programming , which was held in Bordeaux during July 2-6 2018. The prestigious statistical software Statistical Analysis System (SAS) announced in early 2010 to include the Wong and Li's ARCH test in one of its time series Procedures. Dr. He and his co-authors receives the Second Prize for the 2019 Award for Outstanding Research Articles in Biosurveillance by The International Society for Disease Surveillance (ISDS). The award is for their article 'Modelling the large-scale yellow fever outbreak in Luanda, Angola, and the impact of vaccination'. Members of the winning team of 2018 Outstanding Achievement Award in Scientific Research for Institution of Higher Education (Second Prize) administrated by the Ministry of Education of the People's Republic of China. Dr. T.K. Pong won the Early Career Award 2015/16 presented by the Research Grants Council. Dr. Pong is the only faculty member from PolyU who received the Award in 2015. The PSA Women's Player of the Month Award for July 2015. Please click here for details. Champion of Contrex SquashChallenge Cup 2015. Please click here for details. 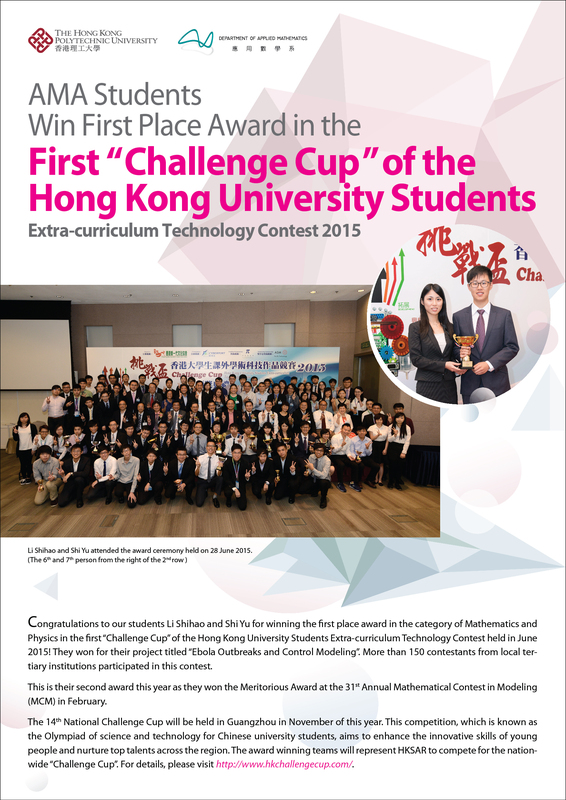 Winner of the first place award in the category of Mathematics and Physics in the first "Challenge Cup" of the Hong Kong University Students Extra-curriculum Technology Contest in June 2015. Please click here for details. The team received the best results among other Hong Kong students at the 31st Annual Mathematical Contest in Modeling in February 2015 For details, please click here.